Dewahost offers business class web hosting service with fast and friendly 24/7 technical support, starting from as low as $8.95/month. Enjoy all the best Jukebox Jockey has to offer. In addition to all the features found in our lesser editions, the Platinum Edition includes Unlimited Users, Advanced Imports/Exports, Preview Player, Volume Mixer, Advanced Filters, Scheduling, and Advertisement insertion. 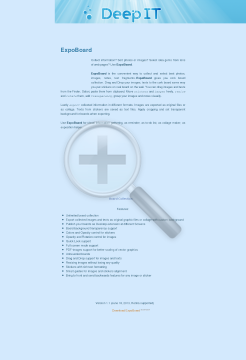 ExpoBoard is the convenient way to collect and select best photos, images, notes, text fragments. ExpoBoard gives you cork board collection. Drag and Drop your images, texts to the cork board same way you put stickers on real board on the wall. You can drag images and texts from the Finder, Safari, paste them from clipboard. Move stickers and images freely, resize and rotate them, add transparency, group your images and notes visually. Lastly export collected information in different formats. Images are exported as original files or as collage. Texts from stickers are saved as text files. Apply cropping and set transparent background for boards when exporting. Use ExpoBoard for visual information gathering, as reminder, as to-do list, as collage maker, as exposition helper. 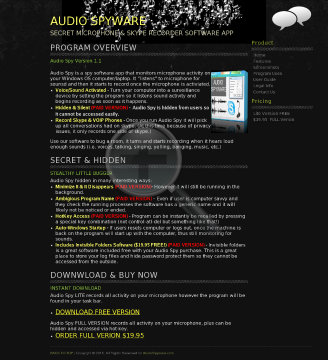 Audio Spy is a small program that secretly records .wav files from all microphone activity including skype. It is a great way to use your laptop to bug a room. It will record all voices and sounds it picks up. Listen to your own music, to online radio stations, watch your favorite movies and enjoy your photo memories while the music is playing. With ZenPoint DigitalCenter, you can listen to your own music, karaoke songs, to online radio stations, see your favorite movies or enjoy your photos in a nice slideshow. You can create playlists for the whole family or choose specific topics. It’s also possible to set the program into PartyMode, then it will act as a jukebox, where the songs are placed in a queue. 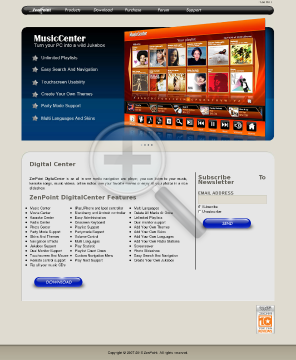 ZenPoint DigitalCenter comes with more than 10000 different radio stations. ZenPoint DigitalCenter can be configured to meet all your needs, from a privat music center to a jukebox or a slideshow of all your images. Can be used with a touchscreen or a mouse. ZenPoint DigitalCenter also supports “Dual Monitors”. YouTube Downloader is an easy-to-use program that will allow you to download video from YouTube.com. The program has a built-in video converter that supports all popular video formats and has preset settings for converting to formats compatible with iPod, iPhone, PSP, Cell Phone, Xbox and other devices. You can also search the YouTube server right from the program. Download YouTube Downloader right now and start downloading your favorite videos from YouTube.com. 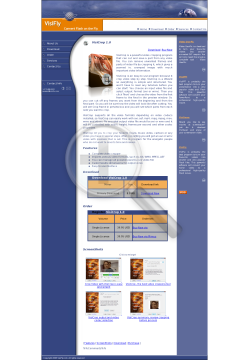 mediavigor.com – Informationen zum Thema mediavigor. mediavigor.com ist Ihre erste und beste Informationsquelle über mediavigor Hier finden Sie auch weitere interessante Links. Wir hoffen, dass Sie bei Ihrer Suche erfolgreich sind! 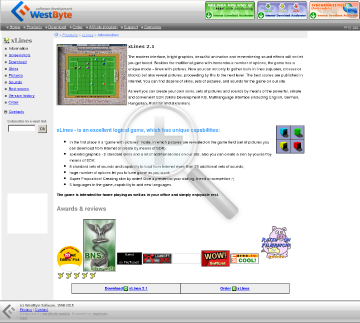 WestByte Software web site. 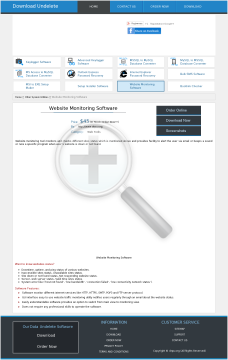 Award winning software for internet, office and home. Internet Download Accelerator – Premium Download Manager! The modern interface, bright graphics, beautiful animation and remembering sound effects will not let you get bored. Besides the traditional game with tremendous number of options, the game has a unique mode – lines with pictures. Now you can not only gather balls in lines (squares, crosses or blocks) but also reveal pictures, proceeding by this to the next level. The best scores are published on the Internet. 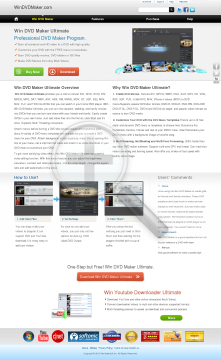 Windows DVD Maker Ultimate Official Site – Make Professional DVD Just One Click. Create professional DVD from almost all popular formats, including AVI, WMV, MKV, DivX, XviD, MPEG, MP4 (MPEG-4), QuickTime Movie (MOV, QT), Real Video (RM, RMVB), 3GP (3GPP, 3GPP2), FLV, H.264/AVC, M2TS, M2T, and MTS. Find, resize, crop, watermark, enhance, convert, rename, and process your images and photos in 30+ formats with 120+ filters using this graphics software. High resolution desktop backgrounds. Images was prepared by AiS Watermark Pictures Protector. Watermarker.com – tools for watermarking and image processing. You will find about hundred high resolution Autumn photos (JPEG 1600×1200, 180dpi) and trial versions of all our products (AiS Watermark Pictures Protector, AiS Watermarker ActiveX, AiS XP Images) on this CD-ROM. Vuze to Go is a version of Vuze – the world’s most popular application for finding, downloading, and playing HD videos – that’s designed for portable hard drives. With Vuze to Go, you can carry the Vuze application, Vuze HD Network, and Vuze HD files, all on a pocket USB drive. VisiPPT is probably the best program to turn your presentation into a very popular video and Flash files. This powerful software will convert your PowerPoint to a professional high-quality movie. Microsoft Office PowerPoint is a presentation program developed for the Microsoft Windows operating system. Being widely used by business people, educators, and trainers, it is among the most prevalent forms of persuasion technology. It is a component of the Microsoft Office system. 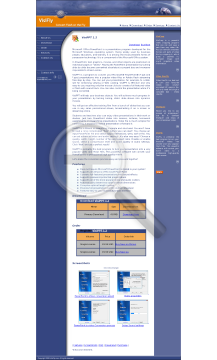 In PowerPoint, text, graphics, movies, and other objects are positioned on individual pages or “slides”. Playing the PowerPoint presentation by turning slide by slide become somewhat obsolete at a present day and moreover impossible to stream online. VisiPPT is a program to convert your Microsoft? PowerPoint? (*.ppt and *.pps) presentations into a popular video files or Adobe flash streaming files step by step. You can put your presentation, for example, to a Web site for streaming viewing or Web casting. VisiPPT is effective and very easy to use, requiring only few mouse clicks to create a full featured video or flash with sound track. You can also control the presentation while it?s being converted. VisiPPT will help your business objects. You will achieve much progress in your presentation by turning boring, static slide shows into dynamic movies. You will got an affective training film from a bunch of slides that you can use in any sales promotional shows, broadcasting it on a screen or streaming online. Students and teachers also can enjoy video presentations in their work or studies. Just turn PowerPoint slides into lessons, lectures, homework assignments or researching presentations. Video file is much simplier for controlling, it enables to rewind presentation or forward it. VisiPPT is a Wizard so everything is simple and stuctured. You won’t have to read a long complicated “help” before you can start! You choose an input PowerPoint file and select output format (avi, wmv, swf or flv). You can set advanced video and audio settings – it’s also very easy! Choose a quality, width, height, number of fps and aspect ratio. Disable or enable sound, select a compression level and audio quality in audio settings. Click ‘Next’ and get a perfect result! VisiPPT is probably the best program to turn your presentation into a very popular video and Flash files. This powerful software will convert your PowerPoint to a professional high-quality movie. Let’s make the conversion process easy and pleasant together!